It's just beautiful. I'm McLovin' it. The Knicks fans have been screaming for Isiah Thomas to be fired for a whole month, and it doesn't seem he is going to go away. 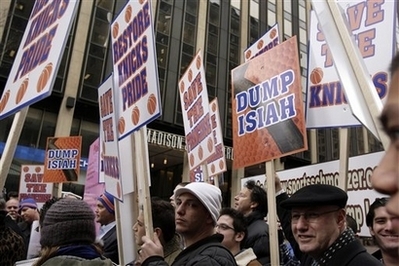 New Yorkers shouldn't act so shocked that Isiah is not accepting responsibility. This is a town that was built on passing the buck. This town is more Republican than you might think. 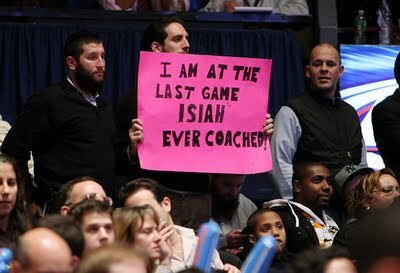 Isiah is the perfect coach for the Bush era. He doesn't hold himself accountable. But today he did say that discussion of his termination would be "fair" if he can't get the Knicks on-track by the first week in January. Live with it, Knicks fans. You too, Spike. Live with your awful pro basketball team that will never win a second O'Brien trophy.